Religion, a strong belief in the existence of an omnipotent supernatural being that controls human destiny, has long been part of the Naga way of life. Even before Nagas converted to Christianity, they believed in the existence of a Creator, and to whom different Naga tribes accorded different names. Most Naga tribes also had a clear belief system pertaining the afterlife. Part of this article argues that it is therefore a misnomer to define traditional Naga religion as ‘animistic’, as has been commonly done. However, ancient Naga religion did not generate a sense of Naga nationalism in the way, I will argue, Christian conversions did. By the late 19th and early 20th century, many Nagas had been converted to Christianity. At the same time, Nagas’ self-awareness as a political community that shared a common identity and destiny was also born. This article contends that Christian conversion was predominantly responsible for the rise of Naga nationalism. Allen, B. C. (1905), Naga Hills and Manipur: Socio-economic history, Delhi: Gian Publications. Baruah, S. (2003), ‘Confronting constructionism: Ending India’s Naga war’, Journal of Peace Research 40(3): 321-338. Burling, R. (2007), Language, Ethnicity and Migration in Northeast India, University of Michigan, Accessed at http://wwwpersonal.umich.edu/~rburling/Language%20and%20Ethnicity.pdf on 06 February 2017. Chidester, D. (2009), ‘Darwin’s Dogs: Animals, animism, and the problem of religion’, Soundings: An Interdisciplinary Journal 92 (1/2): 51-75. Das, G. (2013), Insurgencies in North-East India: Moving towards resolution, New Delhi: Pentagon Press. Elwin, V. (1961), Nagaland, Shillong: P. Dutta for the Research Department, Adviser’s Secretariat. Hechter, M. (2004), Containing nationalism, New York: Oxford University Press. Henningsen, B. (2007), The Church’s contribution for unity and welfare in Nagaland, Kohima: Council of Naga Baptist Churches. Iralu, K. D. (2005), ‘The fifty four year Indo-Naga conflict’, in M. Hussain (ed. ), Coming out of violence: Essays on ethnicity, conflict resolution and peace processes in North-East India, New Delhi: Regency Publications: 170-196. Lasuh, W. (ed.) & V. K. Nuh (compiled) (2002), The Naga chronicle, New Delhi: Regency Publications. Longvah, S. (2015), Peace process in Nagaland and the role of Naga People's Front, PhD. thesis, North Eastern Hill University. Luithui, L. & N. Haksar (1984), Nagaland file: A question of human rights, New Delhi: Lancer International. Lorin, P. S. & E. R. Spees (1990), ‘Religion: Backbone on Naga nationalism’, International Journal of Intercultural Relations 14(3): 355-363. Mao, X. P. (2013), ‘Nagas: Past, Present and Future’, The Morung Express (Nagaland), 31 June, Accessed at https://www.facebook.com/permalink.php?story_fbid=1459323160970885&id=1411098625793339 on 19 April 2017. Mawon, S. (2015), Traditional Tangkhul Naga festivals: A study of the use of music and musical instruments, PhD. thesis, North-Eastern Hill University. Mawon, S. & S. Longvah. (2014), ‘The Struggle for Power: Church leaders in the Naga political movement’, Asian Journal of Research in Social Sciences and Humanities 4(5): 336-343. Michell, J. F. (1883), The North – East frontier of India, Calcutta: The Superintendent of Government Printing. Nag, S. (1999), Nationalism, separatism and secessionism, New Delhi: Rawat Publications. Nakhro, M. (2017), ‘The two missing ingredients in Naga politics’, The Morung Express (Nagaland), 22 February, Accessed at http://morungexpress.com/two-missing-ingredients-naga-politics/ on 02 April 2017. Owen, J. (1844), Notes on the Naga tribes in communication with Assam, Calcutta: W.H. Carey and Co., Cossitollah. Sakha, T. (2015), ‘History of Naga nationalism from the religious perspective’, Eastern Mirror (Nagaland), 17 November, Accessed at http://www.easternmirrornagaland.com/history-of-naga-nationalism-from-the-religious-persppective/ on 02 April 2017. Sangtam, S. (2016), ‘Naga nationalism and the death of God: A reflection’, The Morung Express (Nagaland), 13 December, Accessed at http://morungexpress.com/naga-nationalism-death-god-reflection/ on 02 April 2017. Sema, H. J. (2013), Traditional and modern political institutions of the Nagas, New Delhi: Mittal Publications. Singh, C. (2004), Naga politics: A critical account, New Delhi: Mittal Publications. Sitton, D. (1998), ‘The basics of animism: Spiritual warfare in tribal contexts’, International Journal of Frontier Missions 15 (2): 69-74. Smith, A. D. (2001), ‘The Origins of Nations’, in V. P. Pecora (ed. ), Nations and Identities: Classic readings, Massachusetts: Blackwell Publishers Ltd.: 333-353. Shimray, A. S. A. (2005), Let freedom ring: Story of Naga nationalism, New Delhi: Promilla and Co. Publishers. Thomas, J. (2016), Evangelising the nation: Religion and the formation of Naga political identity, New Delhi: Routledge, Taylor & Francis Group. Upreti, B. C. (2006), ‘Nationalism in South Asia: Trends and interpretations’, The Indian Journal of Political Science 67(3): 535-544. 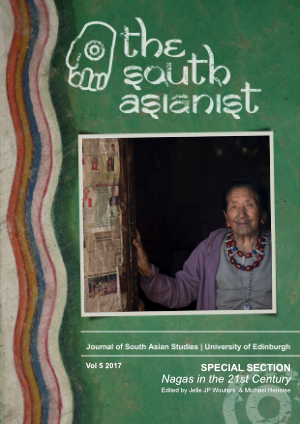 Vashum, R. (2000), Nagas’ right to self-determination: An anthropological-historical perspective, New Delhi: Mittal Publications. Wouters, J. J. P. (2016), ‘Sovereignty, Integration or Bifurcation? Troubled histories, contentious territories and the political horizons of the long lingering Naga movement’, Studies in History 32(1):97-116.